Super Bowl 51: Results And Live Blog (Plus #SuperBowlHaiku) : The Two-Way After three quarters, you would have been forgiven for thinking the game was a rout by the Atlanta Falcons. Then, the Patriots clawed back to win the first overtime game in Super Bowl history. 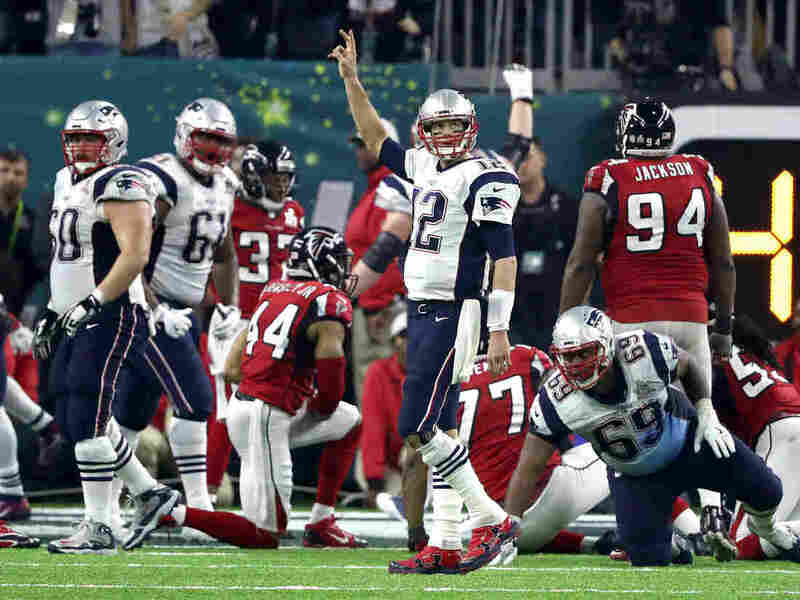 Tom Brady of the New England Patriots calls for a two-point try in the fourth quarter of the Super Bowl. The Patriots converted that attempt to send the game into overtime. The heroics of quarterback Tom Brady, the suddenly stiffened spine of the Patriots defense and one catch by Julian Edelman that defied both gravity and belief — by some incalculable logic, they combined to bring New England to a tie that few people would have thought imaginable just 15 minutes before. They scored 25 unanswered points to send the game into the first overtime in Super Bowl history. And after the Patriots won the coin toss to receive the first possession, their efficient march down the field toward yet another score seemed almost an afterthought. It was a game that etched Brady's place in football history. If he and his coach, Bill Belichick, were not already considered the best all-time at their respective roles, it certainly won't be difficult to make an argument for that now. Sunday's win marks the pair's fifth Super Bowl win together. We were here right along with you all night, live-blogging the big game and — because we're NPR — writing a little poetry while we were at it. Click here to head straight to the live blog below. Last year, we covered the game almost entirely in haiku. This year, our colleagues at WBUR had some more of their own — and we invited you to do the same using the hashtag #SuperBowlHaiku. We retweeted some of our favorites as the night went along. But before we got started, we fulfilled a little promise. When we wrapped up last time around, we posed a question: "Next time, limericks?" That’s it, that’s all, folks. Thanks for haikuing with us. But can Falcons at last reward fans? Still, both keep interrupting the ads. Scroll down for a glimpse of the historic game as it unfolded — plus a few more limericks while we were at it. Just like that, what looked like a rout has given way to what may be the greatest comeback in New England Patriots history. And the Patriots converted another two-point try to knot the game up at 28. For those keeping note at home, that makes for a flabbergasting 25 unanswered points for the Patriots. Welcome to the first overtime in Super Bowl history, ladies and gentlemen. Is that a glimmer of hope we detect? New England's defense forced a huge turnover, strip-sacking Atlanta's Matt Ryan to take over the ball in Falcons territory. With just a couple efficient dink-and-dunk throws, Tom Brady's Patriots spanned the short field easily. But what's perhaps more important: They also converted their two-point try after the score, bringing themselves to within eight points of the Falcons — in other words, just one score away, potentially. Interesting note, as we eye the dwindling time on the clock: There has never been a Super Bowl that has gone into overtime. Might we see that streak broken tonight? Three quarters down, just one more to go. A stalemate in the third leaves the Patriots hoping for a miracle. Suppose it's a bit better than none. Sometimes, simply nothing goes your way. The Patriots cobbled together a scoring drive — their first touchdown of the game — only to see their kicker, Stephen Gostkowski doink the ball off the upright, missing the point after. NPR's Tom Goldman notes Pats fans in the stands high-fiving and shaking their heads at the same time. Still, it's reason to hope: a score of 28-9 looks a whole lot better than just 28-3. And it's difficult to count Tom Brady out of any game, no matter how steep the road ahead appears. Patriots fans, avert your eyes. After New England stalled on its opening drive of the half, Atlanta wasted no time in making them pay. A long strike to wide receiver Taylor Gabriel was the marquee play on a drive that proceeded like clockwork. Blink, and you just might have missed the Falcons pick their way toward the end zone to make it 28-3. Though for some New England fans, covering their eyes may very well be advisable at this point. It was a crucial moment to reclaim some momentum off the bat at the start of the first half — but the Patriots didn't do much with their prime field position. After inching forward just a little, New England ended its drive with yet another punt. "The low-key beginning, which also included a quote from the Pledge of Allegiance, was hinted at during a press conference on Thursday when Lady Gaga said she wanted to try unite America by focusing on inclusiveness and equality. To help drive home the message, the studio wizards at the Super Bowl swirled an assortment of drones depicting blue and red stars in the background before finally forming the American flag. "She ended the performance after 'Bad Romance' by dropping her mic and catching a silver-studded football as she jumped off camera. There were no 'Left Shark' moments this year — just a solid spectacle." NPR's Tom Goldman asked Patriots fan Mark Hartnett, a Boston native, for his reaction to the first half. Tom says it took Hartnett a full five seconds to respond, before finally saying simply: "Dumbfounded." Hartnett's face was expertly painted — half red, half blue, separated by a black line down the middle. And he was frank with Tom about the facepaint. "It's going to dissolve pretty easily with my salty tears later." Well, that sure changed fast. Knotted at zero to begin the second quarter, the Falcons and Patriots immediately took separate directions. A last-second field goal put the Pats on the board before halftime — but that's not likely to assuage their worried fans. The deficit remains daunting at 21-3. Once a drought? So much for that saga. Forgive a misstep from this blogger. Now halftime: Here comes Lady GaGa. Falcons defensive back Robert Alford scores an 82-yard touchdown after picking off a pass by Patriots quarterback Tom Brady. The score gave the Falcons a daunting lead. 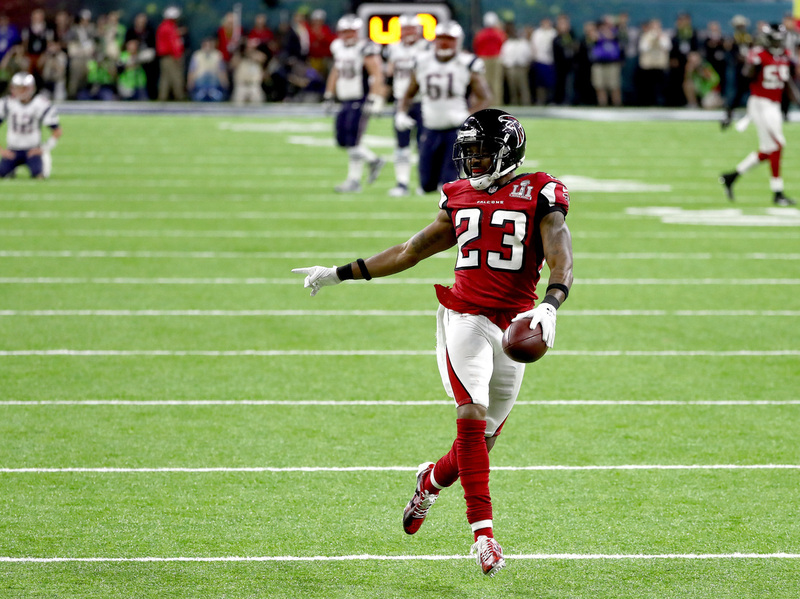 What was a promising Patriots drive unraveled remarkably quickly, as a pressured Tom Brady threw into double coverage — and ended up watching Falcons defensive back Robert Alford take his pass 82 yards in the opposite direction for a touchdown. The pick-six puts Atlanta up 21-0 and leaves the Patriots on the ropes. Prior to that drive, the Patriots were staring up at a steep challenge to come back; after that interception, they may be just doing their best to avoid a rout. "The shock was palpable," NPR's Tom Goldman says from the stands in Houston: utter joy from Falcons fans, while the New England faithful fell to silence. Atlanta's offense is looking all but unstoppable at this point. Julio Jones, once again, shed defenders left and right on that drive — even making one toe-tapping catch on the sideline with grace worthy of a ballet dancer. Then, the moment the Patriots try to double-team him ... Matt Ryan makes them pay with a long touchdown toss to tight end Austin Hooper. At the moment, it's looking like the big question is less which team will win, and more which Falcon most deserves the MVP — Ryan or Jones? Of course, there's a whole lot of football left to play. Fresh off a turnover forced by rookie Deion Jones, Atlanta marched down the field on a few huge gains, notching the first touchdown of the game. It's 7-0, Falcons' advantage. Matt Ryan and his other-worldly No. 1 receiver, Julio Jones, gashed the Patriots defense on two big throws, leaving Devonta Freeman to add another jewel to his increasingly gaudy stat line. Freeman waltzed into the endzone untouched. Meanwhile, LeGarrette Blount, the Patriots running back who coughed up the football to set up the Falcons' scoring drive, is left to reflect on a rare mistake: He had been fumble-free for 16 games straight before the slip-up. One quarter down, and we're still 0-0. Why not mark the moment with another limerick? It's supposed to be a big shootout? But so far, a big ol' scoring drought. One unsuccessful drive each, but the Patriots have emerged the worse for the exchange. A big run from Falcons running back Devonta Freeman gave Atlanta an advantage in field position, backing Tom Brady and co. up against their own end zone. But the Patriots have begun chipping back toward center field on the strength of a few big throws. This is expected to be an issue all game for the Falcons, whose defense is not nearly as strong as its weapons on the offensive side of the ball. Well before fans and players packed the stadium in Houston, Pope Francis released a message for all the millions who would be watching the game. "Great sporting events like today's Super Bowl are highly symbolic, showing that it is possible to build a culture of encounter and a world of peace. "By participating in sport, we are able to go beyond our own self-interest. And in a healthy way — we learn to sacrifice to grow in fidelity and respect the rules. "May this year's Super Bowl be a sign of peace, friendship and solidarity to the world." NPR's Tom Goldman is at the game, and he says one thing stands out immediately: "It's a PATRIOTS CROWD!" Attempts at starting up a pro-Falcons chant in the crowd have been petering out — only to bow beneath the loud roar of Pats fans in Houston's NRG Stadium, Tom notes.